IDF hits Hamas with artillery, airstrikes in possible prelude to ground attack. Planes report direct strike on rocket-launching cell. 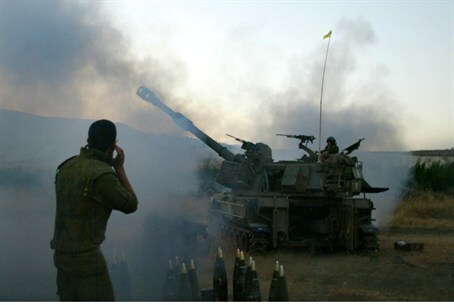 The IDF hit dozens of Hamas and Islamic Jihad targets in Gaza on Tuesday afternoon. Tanks outside Gaza fired on launch sites just within the region, while IAF planes hit Hamas positions farther into Gaza from above. One of the targets hit was a terrorist cell that had been launching rockets at Israeli towns. Pilots first waited to determine that there were no civilians in the area before striking the cell. Two Hamas terrorists were killed in the strike. A third Hamas man was killed as well, also while attempting to fire a rocket. The heavy bombardment has led to predictions that the IDF is anticipating a ground operation in the near future. Hamas bombarded southern Israel on Tuesday morning, and fired one rocket toward the Jerusalem area. The rocket struck the Gush Etzion region south of the capital and did not cause injury. One attack severely wounded an IDF reservist. At least two Israel homes were directly hit by rockets, but thankfully, neither attack caused injury. In Be’er Sheva a rocket exploded next to bus just seconds after its passengers had run off after hearing a rocket alert siren.